Being an owner of a water-loving golden retriever, we are always looking for a place for our dog to swim. Living in the Lehigh Valley, we have to drive a bit to get to an actual beach. The closest we've found is called Longport Dog Beach in New Jersey. It took us a little over 2 hours to get there, but it was worth it to see the Dog Utopia atmosphere! Dogs were running off leash and playing in the water, together! Even my Cooper, who was 11 years old at the time, frolicked and even let another dog take his stick! One thing to beware, there were no bathrooms for the people (at least where we were parked). Check out https://www.bringfido.com/attraction/9653 for more detailed info. Our other favorite dog beach destination is Cape Henlopen State Park in Delaware. It's about 2 hours 45 minutes from the Lehigh Valley. Dogs are allowed on the beach all day (not just off-hours). It's very close to Rehoboth. We typically stay at a dog-friendly hotel in nearby Rehoboth and drive to the Cape each day. We've gone there many times over the years and its a great place to enjoy the beach, hike and ride bikes. See www.destateparks.com for more detailed info. Offered in the Spring and Fall (Sept 28-30, 2018 and May 10-12, 2019) to benefit the Golden Retriever Lifetime Study. 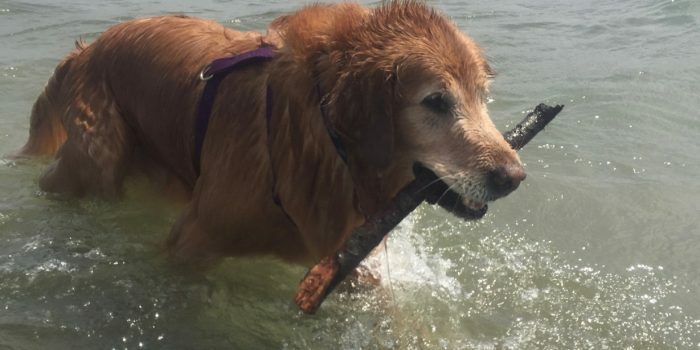 Lots of fun activities are planned for and your golden on Dewey's dog-friendly beach! Usually there is a parade in Rehoboth on Friday evening called the "Gold Rush", Blessing of the Animals the next morning before the festivities, then lots of fun fetching tennis balls in the ocean! Weather permitting, they've also had an evening bonfire. We were there in the fall of 2016 and would love to go again.